China plans to cool down the overheating housing market, especially in third- and fourth-tier cities that saw a new round of surges in June, reported the China News Service on Wednesday. According to the National Bureau of Statistics, housing prices rose in June in 63 out of 70 cities across the country, with the price of new houses increasing 1.1 percent from a month earlier, and 5.8 percent year-on-year. The month-on-month index has continued to grow over four consecutive months, following 0.6 percent in April and 0.8 percent in May. "It has been the largest rise in 21 straight months considering the number of cities where the housing prices rose – and the consecutive growth indicates strong momentum in the housing market," said Yan Yuejin, research director of the think tank center of R&D Institute, E-house China, an organization engaged in real estate market research. The top three cities with the highest growth rates of housing prices in June were Haikou, the capital of Hainan province, with an increase of 3.9 percent, Jinan, capital of Shandong province, at 3.6 percent and Dandong, Liaoning province, neighboring the Korean Peninsula, at 3.3 percent. Zhang Dawei, chief analyst of Centaline Property, said, "The price hike mostly covering the third-and fourth-tier cities, as well as some second-tier ones, has not affected the stability of prices in first-tier cities." Following the increase in housing prices, the government has tightened its policies in real estate markets, controlling growth rates, setting ceiling prices and curbing housing speculations, in hope of maintaining stability in the real estate market. Recently, the Ministry of Housing and Urban-Rural Development readjusted its policy that used to reimburse relocated families by remitting banknotes into their bank accounts so that they could use the money to buy new houses. According to the ministry, to be more resilient, the procedure has been split into two methods according to the situation. Relocated families may be subsidized in cash if the region where they live has an excess of commercial houses, or they may be compensated with new houses if the commercial houses there are more scarce. Zhang Bo, chief analyst of the Research Institute of 58 Anjuke, a research division of the online housing transaction platform, said, "With the control over the real estate market becoming more and more stringent, there would be less volatility in the second-tier cities than in the third- and fourth-tier cities, where the market may keep growing for a period of time." Wang Yeqiang, a deputy research fellow from the Institute of Urban and Environment Studies at the Chinese Academy of Social Sciences, predicted that despite the loosening policies and excessive demands, the housing market in third- and fourth-tier cities may meet with adjustments when de-inventory policies become less influential in the second half of this year. 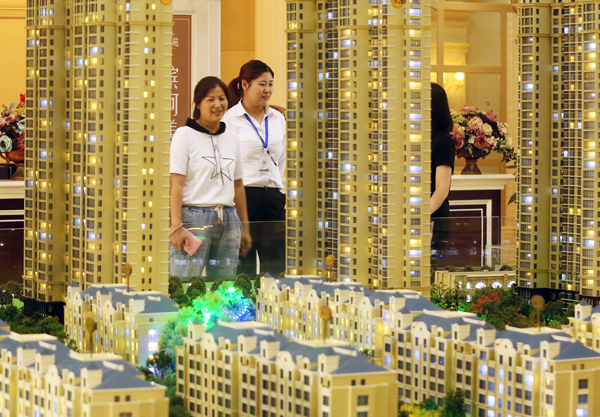 Following a new surge in housing prices in June, China plans to put the brakes on the overheating housing market in third- and fourth-tier cities.